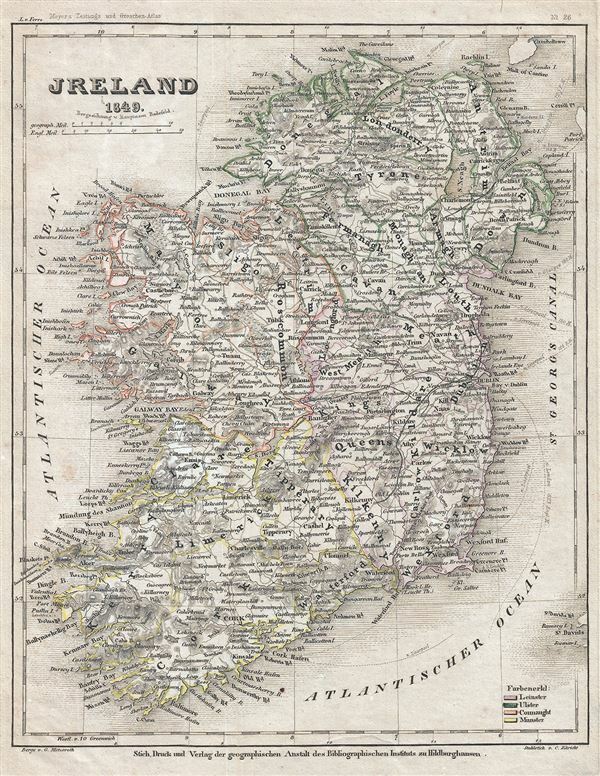 This is a fine 1849 map of Ireland by Joseph Meyer. The map shows all of Ireland divided by county. It covers from Donegal in the north to Cork in the south. After the Norman Invasion the old provincial structure was supplemented with modern system of counties – even so the old provinces are still referenced today. Meyer's map is color coded according to the provinces of Leister, Ulster, Munster and Connacht and identifies important towns, cities, rivers, mountains and an assortment of other topographical features. Relief is rendered by hachure. In 1801, the island of Ireland became part of the United Kingdom of Great Britain and Ireland. Though Britain flourished during this period, Ireland suffered a series of famines, the worst one being the Great Irish Famine, which lasted from 1845 – 1849 and killed about a million people. As a result Ireland experienced a widespread exodus – mostly to the United States. By the end of the 19th century, almost 50% of immigrants into the United States were from Ireland. This map was issued as plate no. 26 in Meyer's Zeitung Atlas. Although all the maps in this atlas are not individually dated, the title page and maps were often updated while the imprint with the date was not, causing confusion to the exact date for some of the maps. Moreover some maps in the atlas were taped in at a later date as an update to the atlas. We have dated the maps in this collection to the best of our ability. Very good. Overall age toning. Some foxing throughout.